Eating healthy can be a challenge. Not just for us, as adults, but for kids, too. I don’t know how it works in your house, but in ours, Sophia is the pickiest eater I have ever met. Well, expect for me as a kid (and well into adulthood), that is. She has her few foods that we know she will eat and not fight us over. The standard kid stuff: chicken nuggets, pizza, mac & cheese, hot dogs, etc. So, trying to get her to try new things has been a bit of a challenge. Maddie, on the other hand? That girl will eat anything we give her and ALWAYS wants to try something new. As you can see, with these two, meal time can be a challenge. Heck, even snack time can be tough. We’ve seen what happens when we give them sweet or salty snacks to hold them over between meals. They crash really hard in a short amount of time. Which is tough when there are things we need to get done. Sophia has ballet class and needs to have her energy up for that. Plus, she’s in Pre-K now, so homework has to get done after school. YES HOMEWORK IN PRE-K. 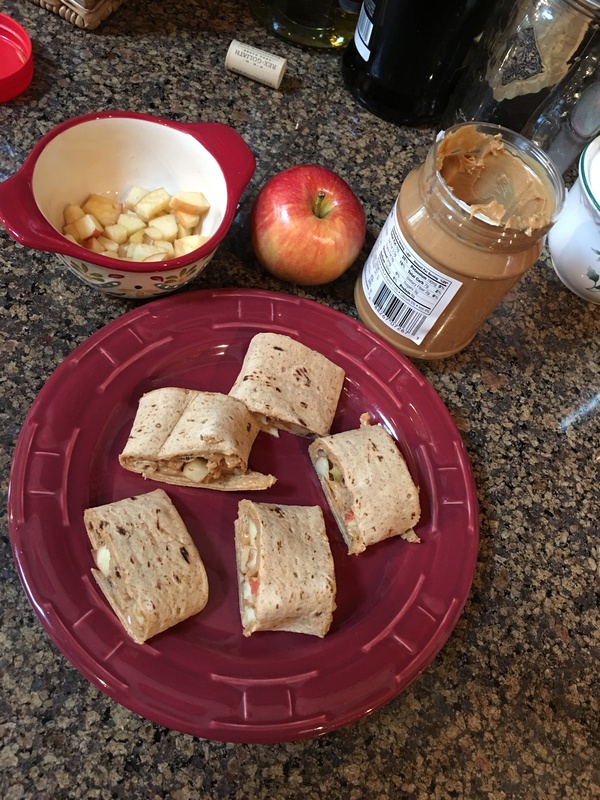 So, with the help of Flatout Flatbread, we started trying to come up with some healthy snack ideas that maybe, just maybe would appeal to Sophia–even at her most picky. First, we thought if we she at least got in the kitchen with us and helped make her own food, it would help her at least want to try something. Second, we thought of ingredients that she liked on their own and figured out a way to combine them that she would like. So, we came up with these tasty little Apple Peanut Butter Rollups. Check out the recipe and instructions below the image. That’s it. It’s pretty simple and was really tasty. Sophia actually loved them and gave them a thumbs up. Plus, she had an absolute blast putting them together. You can see that Flatout breads are a great blank canvas in the kitchen and the possibilities are virtually endless. So, grab some Flatout flatbreads, grab your kids, and get in the kitchen and start creating the perfect food masterpiece. Maybe Don’t try to hang these on your fridge though… Remember, #FlatoutIsMyCanvas! To find a store near you that carries Flatout, visit the store locator: and try a $.50 off coupon. If you want some more delicious recipe ideas, check out the Flatout Facebook page to see what they–and other bloggers–have come up with.